Our Duratemp A-Frame two-story two-car garages are available from 20 feet by 20 feet all the way up to 24 feet wide by 40 feet deep and are built to last with solid wood construction and 7/12 roof pitch. 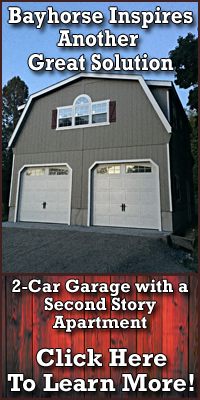 20' wide garages come with two 8' x 6'6" carriage-style garage doors with sunburst and 24' wide garages come with two 9' x 7' carriage-style garage doors with sunburst. Duratemp A-frame two-story, two-car garage measures 20' x 20' and comes with two 8' x 6' 6" carriage-style garage doors with sunburst. A-frame roof is 7/12 pitch. Stop by our Red Hook, NY location to walk through our 24' x 26' Duratemp A-frame two-story two-car display model and look at choices for siding, paint colors, roof shingles and other options. Duratemp A-frame two-story, two-car garage measures 20' x 22' and comes with two 8' x 6' 6" carriage-style garage doors with sunburst. A-frame roof is 7/12 pitch. Duratemp A-frame two-story, two-car garage measures 24' x 20' and comes with two 9' x 7' carriage-style garage doors with sunburst. A-frame roof is 7/12 pitch. Duratemp A-frame two-story, two-car garage measures 20' x 24' and comes with two 8' x 6' 6" carriage-style garage doors with sunburst. A-frame roof is 7/12 pitch. Duratemp A-frame two-story, two-car garage measures 24' x 22' and comes with two 9' x 7' carriage-style garage doors with sunburst. A-frame roof is 7/12 pitch. Duratemp A-frame two-story, two-car garage measures 24' x 24' and comes with two 9' x 7' carriage-style garage doors with sunburst. A-frame roof is 7/12 pitch. Duratemp A-frame two-story, two-car garage measures 20' x 26' and comes with two 8' x 6' 6" carriage-style garage doors with sunburst. A-frame roof is 7/12 pitch. Duratemp A-frame two-story, two-car garage measures 20' x 28' and comes with two 8' x 6' 6" carriage-style garage doors with sunburst. A-frame roof is 7/12 pitch. Duratemp A-frame two-story, two-car garage measures 24' x 26' and comes with two 9' x 7' carriage-style garage doors with sunburst. A-frame roof is 7/12 pitch. Duratemp A-frame two-story, two-car garage measures 24' x 28' and comes with two 9' x 7' carriage-style garage doors with sunburst. A-frame roof is 7/12 pitch.